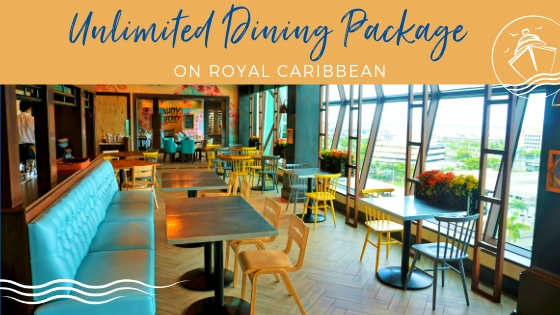 If you are looking for the Celebrity Edge Restaurant menus, then you have come to the right place. These menus are from a recent 7-day Western Caribbean cruise. 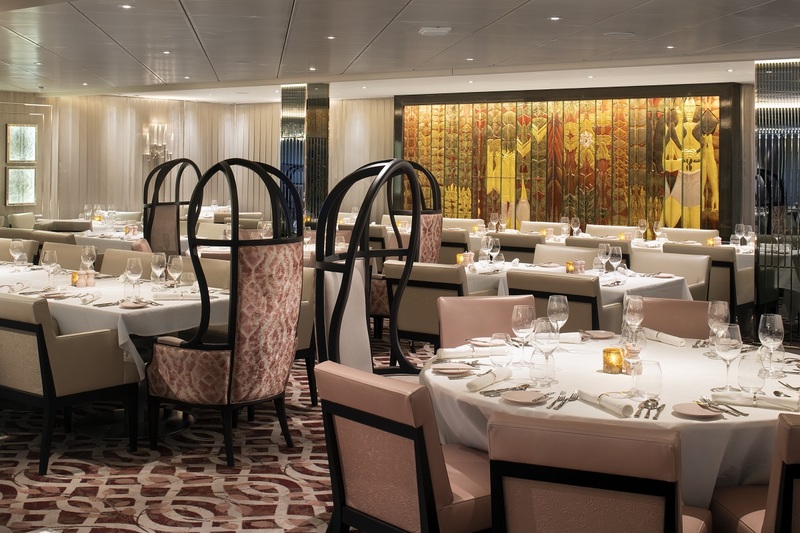 This brand new ship in the Celebrity Cruises’ fleet has several unique specialty restaurants as well as four main dining rooms. 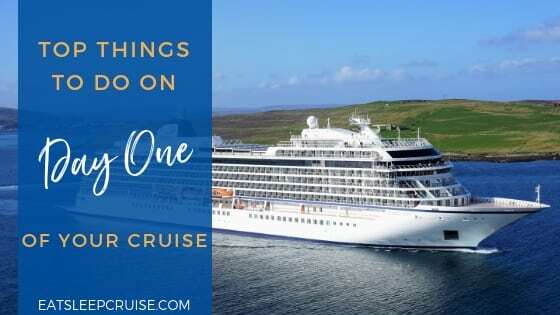 So, let’s just say there is a lot of food to try during your cruise! We have links to each menu, which are loaded as PDFs. 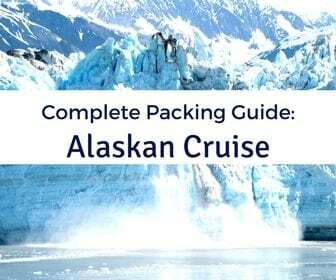 Feel free to browse or download them to help with your cruise planning. 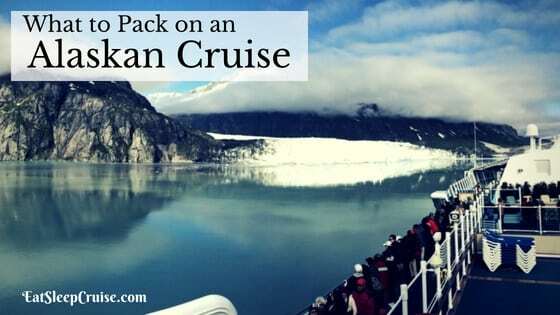 We just ask that if you do share these photos that you credit Eat Sleep Cruise as the source. Every morning of your cruise, the Cosmopolitan restaurant is open for breakfast. Depending on your port of call, the restaurant normally opens around 7:30 am to 8 am and closes around 9:30 to 10:00 am. This is the only main dining room that is open for breakfast. On sea days, the main dining room offers lunch. For our cruise, there were two sea days. 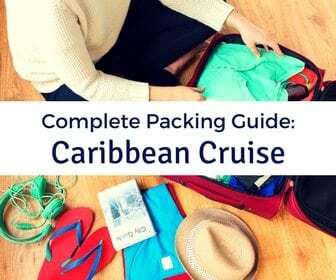 On the Eastern Caribbean cruise, there are three sea days. Celebrity Edge has not one, but four main dining rooms that are open every evening for dinner. 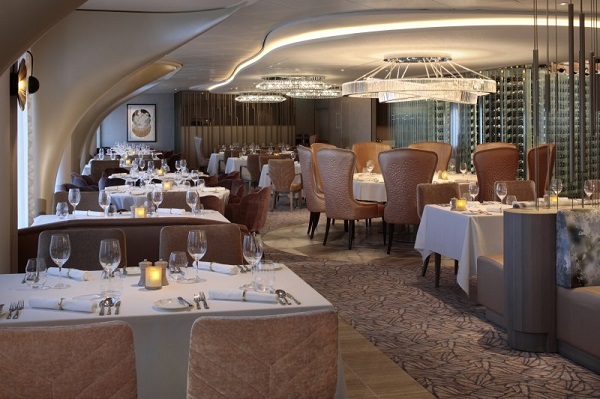 Each main dining room offers a small Exclusive section of the menu, which is reserved for that restaurant and remains the same for the duration of the cruise. Across all four dining rooms, there is a different menu each night. Included in this menu are the Classic starters and entrees. 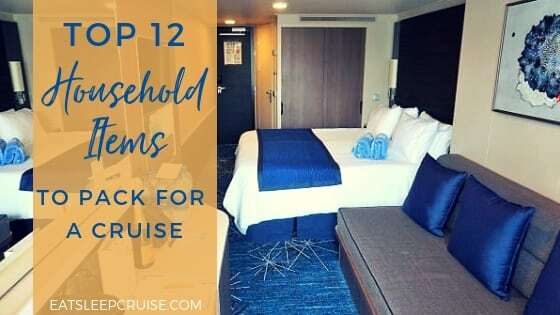 These items never change and can be found in all four dining rooms for the entire cruise. In addition, there are different options as part of the Celebrity Signature menu that are the same in all four dining rooms each evening. 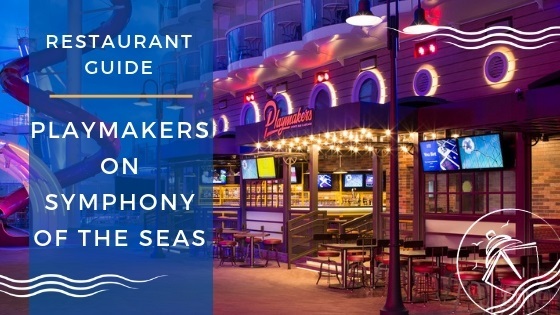 For dinner, cruisers can opt for a traditional early (6:00 pm) or late (8:30 pm) seating with the same table assignment and waitstaff for the duration of the cruise. With this option, you will be assigned to one of the four dining rooms. If you want to try them all, you can opt for the Celebrity Select Dining Plus option. This option allows you to choose which complimentary restaurant you want to dine in each evening and at what time you want to dine. 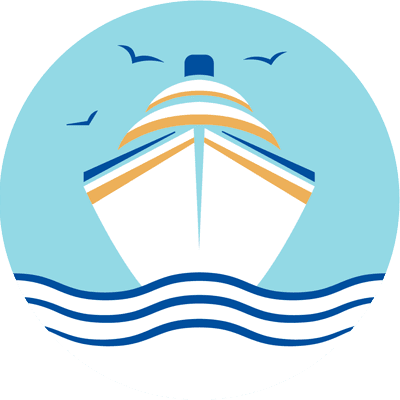 You can either pre-book your reservations, book while onboard the ship, or walk-up to a restaurant on any given evening between 5:30 pm and 9:00 pm. 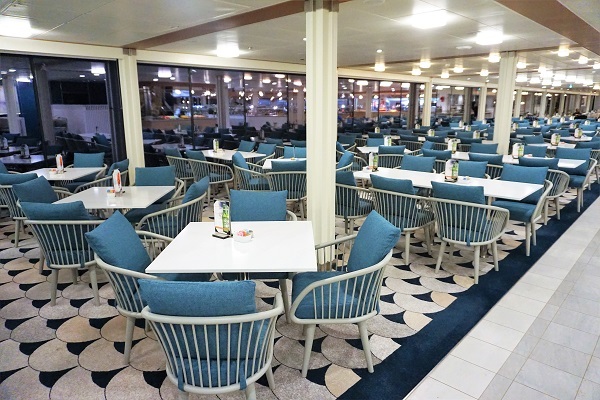 The Oceanview Cafe is your typical cruise ship buffet located on Deck 14 aft. This casual dining spot offers traditional favorites as well as cuisine from around the world with a menu that varies. 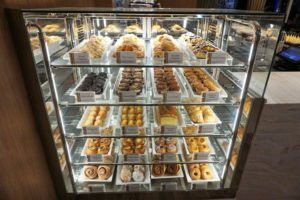 For breakfast (which usually runs from 6:30 am to 11:00 am), there is your typical selection of eggs, pancakes, omelets, breakfast meats, pastries, fresh fruit, and various continental breakfast options. Lunch was usually available from about noon to 2:30 pm. Admittedly, we only ate lunch here once, on embarkation day. The selections did appear more extensive than other cruise ship buffets though, offering several different entree options including Asian and American favorites, a grill with a wide selection of different meats, a custom sandwich shop, a salad bar, pizza, pasta, a charcuterie section, carving station, and other options. Dinner in the buffet is served from 6:00 pm to 9:30 pm, with the Pizza and Pasta stations staying open until 1 am. Again, the menu varies each night with a variety of different entrees under the Global selections and other consistent items such as the grill and pasta stations. Located inside the Oceanview Cafe is il Secondo Bacio, a coffee shop serving up espresso drinks (which are covered on Celebrity Cruises’ Beverage Packages) along with beer, wine, and a few select cocktails. The venue also has bottled water, soda, and Vitamin Water if you need re-hydration. Located on Deck 14 in the Solarium, the Spa Cafe and Juice Bar serves up healthy options as an alternative to the buffet for breakfast and lunch. The Spa Cafe is open for breakfast approximately 7 am to 9:30 am and for lunch from noon to 2 pm. 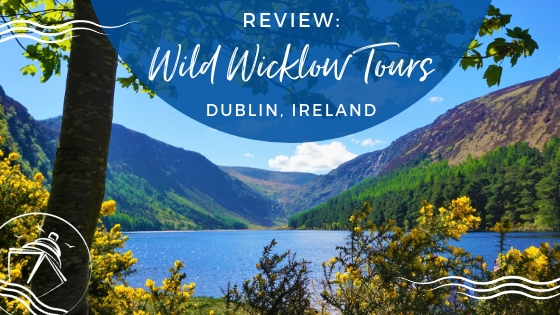 Featuring small plates and gourmet smoothies (covered in the Premium Beverage Package), this is the perfect spot to grab a quick bite to eat while relaxing on a sea day. This outdoor, casual eatery is a great place to grab some lunch or a midday snack while lounging poolside. 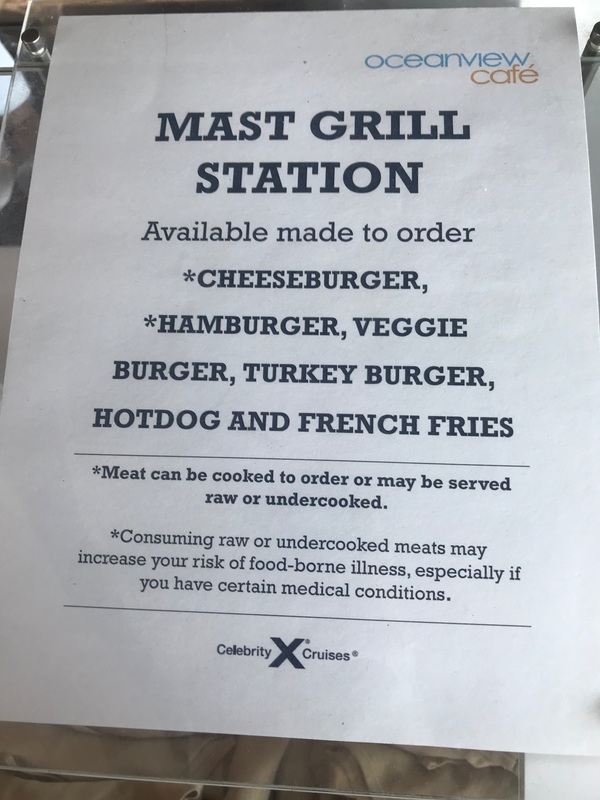 Serving up burgers and fries and some other grill favorites, the Mast Grill on Deck 14 is open daily from 11:30 am to 6:00 pm. It offers some tables in the shade, or you can just grab a snack and head back to your lounge chair on the Resort Deck. A brand new concept on Celebrity Edge, this casual and complimentary venue is open for breakfast and lunch. The Eden Cafe is a nice change of pace from the buffet. The location allows for beautiful aft views and some comfy furniture to go along with it. 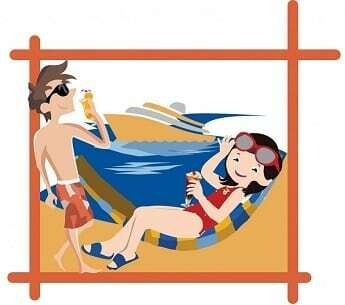 There is also limited al fresco seating on both sides of the ship. Offering warm breakfast sandwiches and a few other favorites like homemade cinnamon buns, this is a great morning stop for a quick bite. 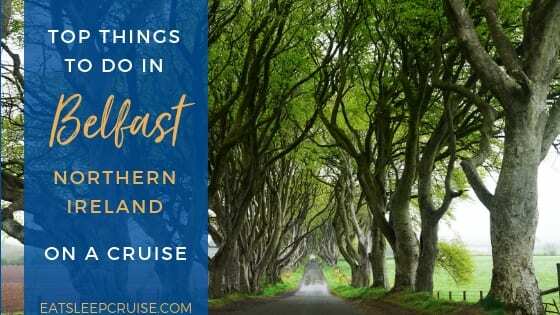 On our cruise, it was open on days 3, 6, and 7 from 8 am to 10 am for breakfast. For lunch, the venue has paninis, warm and cold sandwiches, wraps, and a few specialty salads. During our stop, the daily carved sandwich was hot pastrami. Yummy! The venue was open for lunch on select days from noon to 2 pm. 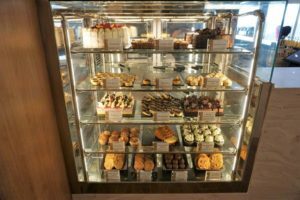 This coffee house located on Deck 4 of Celebrity Edge is the perfect spot to grab a latte (included in the Celebrity beverage packages) and a sweet treat any time of day. All pastries are complimentary and change throughout the day. The venue is typically open from 6 am to midnight. Here are a few examples of the delicious treats that we found on our numerous stops at the cafe. For drinks, the Cafe is home to your favorite espresso drinks including lattes and mochas. There are also several dessert and coffee cocktails available. 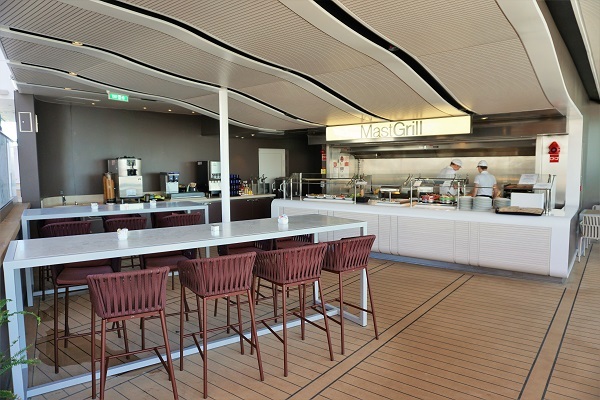 Located on Deck 15, this al fresco restaurant offers some mouth-watering options fresh off the grill. Located in the Rooftop Garden, you will have fantastic views while you dig into classics like baby-back spareribs, roasted chicken, and other BBQ favorites in this sophisticated alcove. This restaurant is open on sea days for lunch ($25) from noon to 1:30 pm and every evening ($45) from 6 pm to 10 pm. 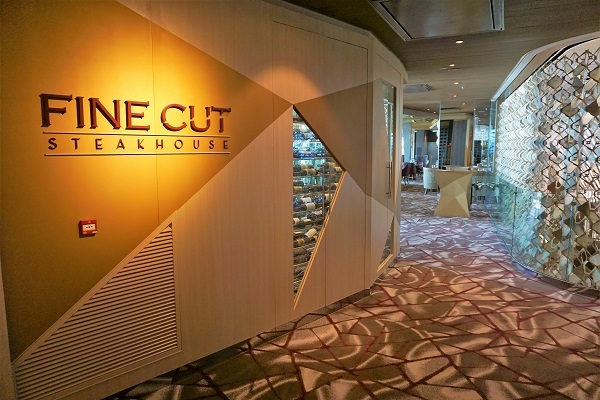 Perhaps one of the most upscale steakhouses at sea, Fine Cut on Celebrity Edge is certainly a slice above other similar venues. With an extensive menu offering up literally almost any type of steak or beef selection you can imagine, this venue is for the carnivore in all of us (They even offered chicken for the Princess). The side dishes should not be overlooked either as they were just as good as the perfectly seared bone-in filet mignon. With a sleek, sophisticated dining room and a small al fresco section, this up-charge restaurant ($55) is open nightly from 6 pm to 10 pm. Reservations are required. This a la carte restaurant on Deck 5 offers a variety of seafood favorites including sushi, oysters, ceviche, and the famous Seafood Plateaux. With a fresh and bright open dining room concept offering ocean views, you can enjoy lunch here on sea days from noon to 1:30 pm. In the evening, you can get a pre-dinner appetizer or a full meal from 6:00 pm to 9:30 pm. On select days, the Magic Carpet is docked here offering a specialty food and drink menu as well. 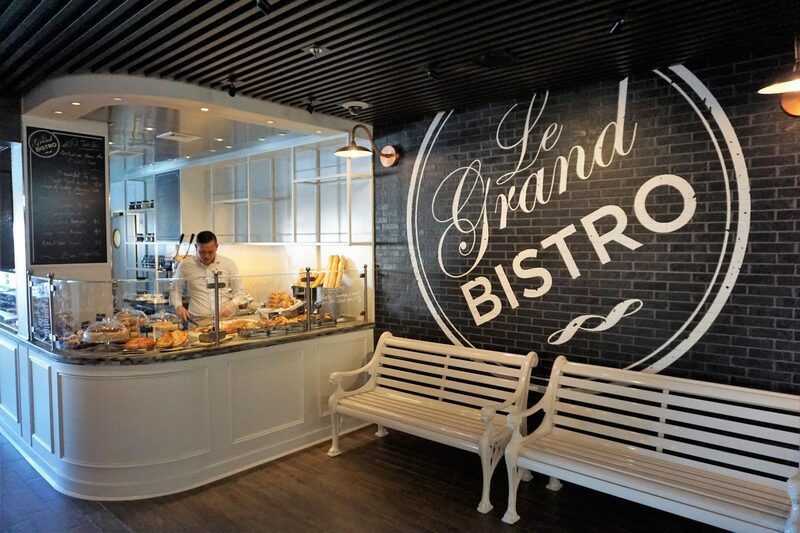 This French-inspired eatery on Deck 4 offers specialty dining for breakfast and lunch. On sea days, you can indulge in a rich breakfast ($10) including custom made crepes and a heavenly egg and bacon sandwich on a freshly made croissant. At lunchtime ($20), which is served from noon to 1:30 pm each day, you can choose from a lighter fare with sandwiches made on fresh baguettes or feast on mussels and steak frites. If you are in a hurry, there is also a to-go menu that is priced a-la-carte. At night, the venue turns into Le Petit Chef and Friends, a digitally enhanced dinner experience ($55) which includes a four-course meal and a “show”. Perhaps the most unique restaurant on Celebrity Edge is the Eden Restaurant. Located on Deck 4, this tasting menu is as distinct as the venue itself. 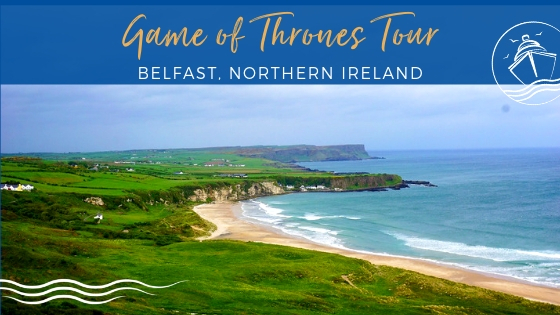 You will be in the center of the action as Edenists roam the dining room engaging with guests and offering unique performances while you enjoy this seafood-heavy five-course meal. This specialty restaurant ($65) is open nightly from 6 pm to 10 pm. Reservations are required. Of note, you do not need to dine at the restaurant to enjoy the nightly performances in Eden. On one select evening of the cruise, the Magic Carpet is docked on Deck 16 for an elaborate “dinner on the edge” experience. For a cost of $75, you can dine on an upscale buffet while enjoying scenic ocean vistas. During our cruise, this event occurred on Day 5. Currently, you can only make reservations once onboard the ship, and the experience does sell out quickly. We inquired about it after the muster drill on embarkation day, and it was already completely booked. The app also advertised a Brunch on the Edge for $50, but it was not offered during our cruise. Have you sailed on Celebrity Edge? 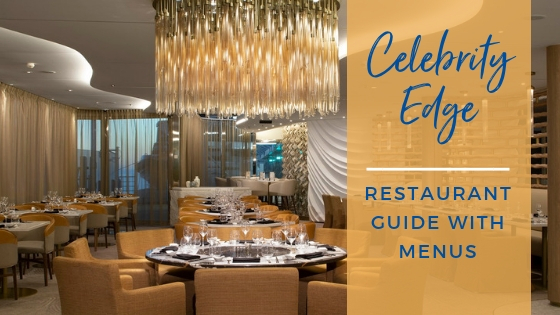 Which Celebrity Edge Restaurant menu is your favorite? Drop us an anchor below to share your dining reviews of this new ship. Thank you for this. Just wish we didn’t have to wait until November.